New Delhi: Delhi Minister Satyendar Jain slammed the CBI for the recent searches at the office of his “former” Officer on Specail Duty (OSD) in Delhi Secretariat and wondered why the probe agency doesn’t investigate the appointments of OSDs by Union Ministers. “If the CBI has to conduct raids on the issue of appointment of OSD to the Delhi Health Minister, you can imagine where the level of the probe agency has reached,” he said. The CBI had on December 29 registered an FIR in connection with alleged irregularities in the appointment of Nikunj Aggarwal at Chacha Nehru Bal Chikitsalya and subsequently as OSD to Jain. The next day, it carried out searches at office of Aggarwal in connection with the case. 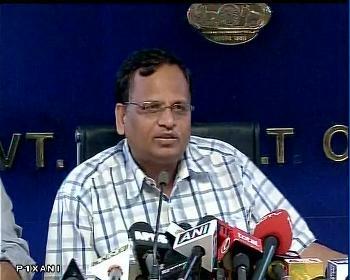 According to Delhi government, there was no irregularity in appointment of Nikunj Aggarwal. “Since October, he has not been holding any official post in the Delhi government as the Health Minister had discontinued his service. Aggarwal had been appointed on contractual basis,” a senior official had said after the CBI’s searches. Jain said that there was no need for a CBI search if the Centre had asked him as to how the appointment of Aggarwal was made. “In the Central government, there are 73 ministers. They (CBI) should also ask Union ministers as to how they have appointed their OSD. Why doesn’t they (CBI) ask them whether they had issued advertisements, sought approval from someone before appointing their OSD,” the Delhi Health Minister asked. He claimed it is the prerogative of a minister to appoint his OSD or hire his personal staff. To a question on whether officers are afraid of such incident (CBI searches), Jain said although the working atmosphere gets affected, officers should work honestly.